It was twenty-five years ago today that hands were laid upon me in a service of ordination at Temple City Christian Church (Disciples of Christ) [June 9, 1985]. Among those participating in that service were members of the Temple City church, it’s interim pastor, Tom Toler, the Regional Minister Charles Mallotte, a local Lutheran pastor, Margaret Duttera, and Ed Linberg, who offered the sermon. Ed had started out as supervisor of my internship, but was called part way through to another ministry. Tom finished out the year (though John Hull and I carried for a few months a lions share of the load – both of us serving as Assistant Pastors). 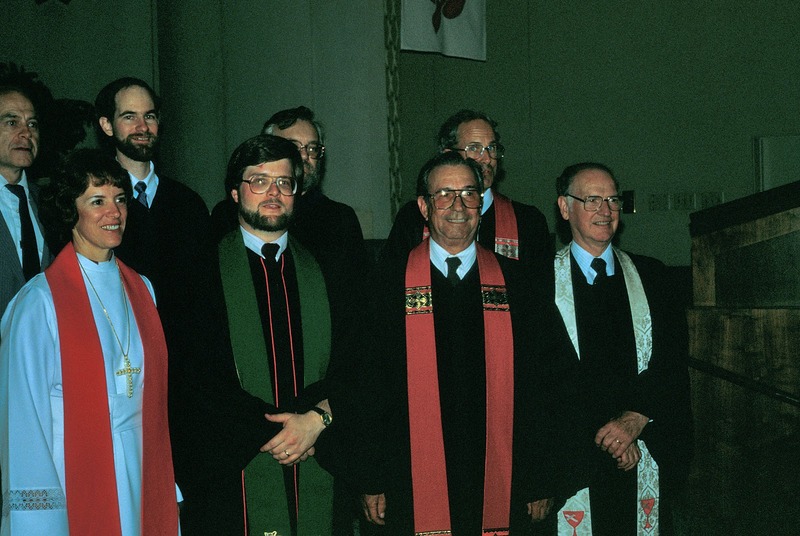 This action of ordination took place a day after I received my M.Div. from Fuller Theological Seminary. It was an important event in my life, perhaps more important than I realized at the time. Twenty-five years ago I had in mind a ministry in the academic world – teaching church history – not serving as the pastor of a local congregation. Yet, for the past twelve years I have served as the pastor of three local congregations. As I consider my ordination on this anniversary day, I thought I might reflect a bit upon what it means for me and for the church at large. For, if as I believe, we are all, as baptized Christians, all priests of God called to engage in the ministry of God, with Jesus as our high priest, then pastoral ministry might best be defined as representative ministry. The pastor could be seen as the bearer of the call to ministry that all Christians participate in. Standing in the pulpit or at the table, the pastor is not only a representative of God (as one who inspired by the Spirit speaks for God) but also as the representative of the people, sharing a message in word and sacrament that emerges from within the community itself. By thinking of pastoral ministry as representative ministry, we start with the premise that all ministry is important. No Christian is by virtue of their office holier than any other. There maybe a difference in roles and even charism, but not importance to the health of the body. The calling of the pastoral leadership is not to do ministry for God’s people but to equip and encourage the congregation in its ministries (Eph. 4:11-13). The goal of pastoral ministry is to help God’s people reach maturity in Spirit, and that maturity leads to acts of service – the good works prepared for us by God. Our ordination to ministry occurs in our baptisms, an act of grace that sets us apart for service to Jesus Christ. Ordination, on the other hand, orders the lives of some for specific areas of service. It is the public recognition that some from among the body are called to representative ministry of preaching, teaching, sacrament, and pastoral care. Although God calls people to this ministry, the church has the responsibility to affirm this call and publicly confer on this person the authority of this office. In ordaining a candidate the church also promises to hold the ordinand accountable to this calling. Although there are no double standards in Christian ministry, the church should expect that the ones upon whom they confer this title of pastor will hold themselves to the highest standards of behavior, that they will seek to understand the faith in such a way that they may might teach and equip others (making it imperative that those called to ordained ministry pursue some form of education/training such as the traditional M.Div. programs). Having had hands laid upon them, ordained pastors (my preferred title) stand as representatives of the church they serve and lead By extending the hands of ordination on candidates, the church declares to the broader church and the community at large, that this woman or man has been found to have the requisite gifts and calling to serve the church at large as pastors and teachers. Though many clergy claim to have felt God's leading, God's call on their lives, without the discerning affirmation of the church that sense of calling may be little more than a delusion. The church is charged with discerning both gifts and calling, and then supporting those called and gifted to fulfill this calling. I stand here today the product of a community of communities who saw in me gifts and encouraged their development and usage. Thanks be to God! I assume that you are the one in the front row with all the chin hair. Yes, I'm in the front row with chin hair, not the one in the back row with the chin hair -- that's John Hull. Congratulations on your anniversary Bob from one of your former congregation members. We were blessed to have you as our pastor when we did, you brought much needed healing to our church family.